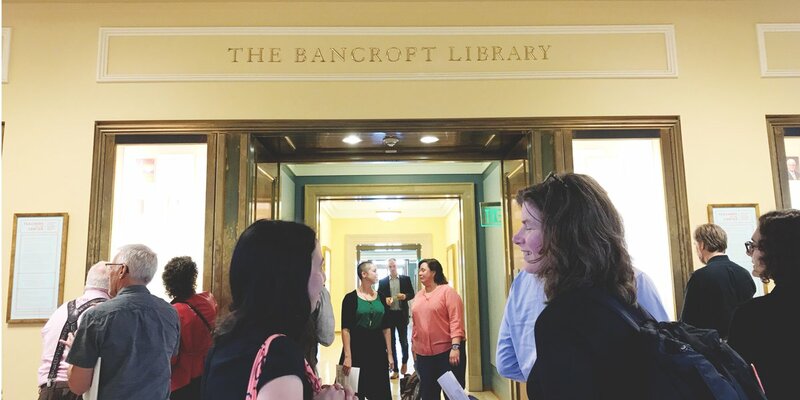 Last week, as an opening to the NWP’s 2017 Board of Directors meeting, almost 40 members of the BAWP, NWP, and University of California community squeezed into the rotunda of Berkeley’s Bancroft Library to celebrate the launch of the NWP Archives. Just beyond the rotunda, along a marbled hallway, the six Rowell Cases displayed artifacts and images from the near 45 year history of our project, starting with the ‘gleam in the eye’ of project founders, proceeding through the first local site at the University of California, Berkeley, continuing through the expansion of the network across the country and Congressional support for federal funding, and finally landing at today. The six prestigeous Rowell Cases. Don’t laugh. Your school or campus has their equivalent, and so you know this is a very big deal indeed. 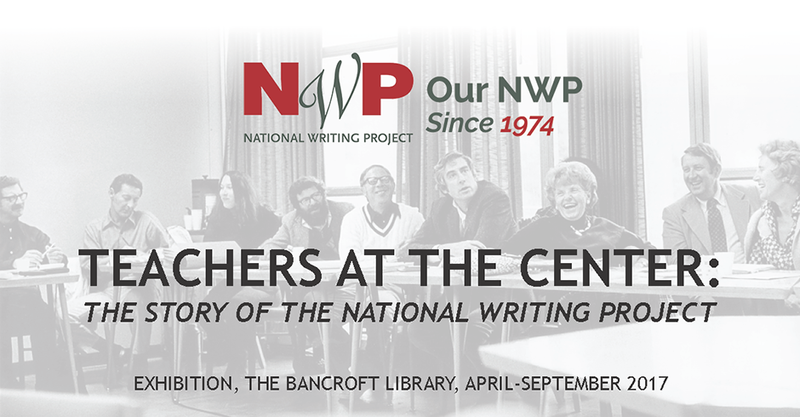 The celebration marked the completion of the first and most significant phase of the NWP Archives Project, an effort by the NWP network and Board of Directors to establish a permanent home for the vast collection of materials, correspondence, legal documentation, and collections of teacher work that are part of our collective history. Beginning in 2014 as a 40th anniversary project, NWP teacher leaders and directors donated generously to create the fund that hired a professional archivist to develop the collection, support the preservation of early materials, and digitize everything for future research, The result is a true scholars’ archive, one that could support significant scholarship into the unique and historically significant organization that is NWP. Mark St. John, longtime evaluator and thinking partner for the NWP, has often said that the National Writing Project is the world’s largest and longest educator improvement network. He quickly adds—“and so far no one has contradicted me!” Mark St. John and his colleagues at Inverness Associates have spent years explaining the uniqueness of the NWP using all kinds of superlatives—and we wouldn’t contradict him either. We are a very special case study in the history of American education, and we don’t doubt that future generations of scholars and historians will find much to study in our example. Of course, the Archive isn’t finished. It couldn’t be finished because we aren’t finished. But the most important steps are complete. Our very precious materials and photos, those that would decay over time, have been preserved on acid-free paper and digitized. Materials that were created in early and now obsolete forms of technology have been preserved and made accessible through today’s technologies. And professional catalogues and finding guides have been developed. And, not to forget, NWP is on display in the Rowell Cases through September. So we celebrate the culmination of the most essential, most foundational “Phase 1.” In the next phases, we will be working on preserving our ever-changing and constantly growing digital assets that represent a kind of repository of knowledge and reflection collected from diverse educators across the country during some of the most significant and transformational periods of modern education. So there is important archival work yet to come. If you are interested in learning more, hear the story of the NWP Archives Project on NWP Radio. As that episode makes clear, the preservation of our history has always been a project of the network, by the network. It is supported entirely by NWP member donations. Your ongoing contributions, however, large or small, ensure our history paves the way for our future.